Cryo-EM reconstruction of narrow Pick filaments extracted from the frontotemporal cortex of a patient who had the frontotemporal dementia Pick’s disease. Michel Goedert’s group in the LMB’s Neurobiology Division and Sjors Scheres’ group in the LMB’s Structural Studies Division have used electron cryo-microscopy (cryo-EM) to solve the structures of tau filaments from patients with the frontotemporal dementia Pick’s disease. These new structures show how tau folds in disease-specific ways, providing evidence for the hypothesis that different molecular structures of filamentous tau give rise to the diversity of symptoms between neurodegenerative diseases. Many neurodegenerative diseases, including Alzheimer’s disease and Pick’s disease, are associated with the ordered assembly of tau protein into abnormal filaments, the abundance of which is strongly correlated with disease symptoms. Tau filaments are found to have disease-specific distributions within the nervous system, as well as distinct biochemical properties. This led to the hypothesis that tau filaments might fold into disease-specific structures. To investigate this, Benjamin Falcon, from Michel’s group, extracted tau filaments from the brain of a patient with Pick’s disease (characterised by Bernardino Ghetti) and collected images of the filaments using Cryo-EM. 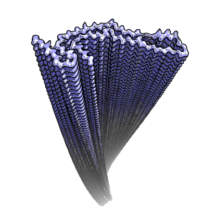 The team were then able to construct a 3D model of the tau filaments using these images and determine the molecular structure of the tau protein within these filaments. Previously, Michel’s and Sjors’ groups solved the structures of tau filaments from patients with Alzheimer’s disease. Comparison of the new structures of filaments from patients with Pick’s disease with those from Alzheimer’s disease demonstrated that the structures are indeed different. These differences may be responsible for the distinct patterns of accumulation in the brain seen between the two variants and for the different ways in which these diseases affect patients. Schematic representation of the secondary structure elements in the Pick and Alzheimer folds, depicted as a single rung. The positions of C322 and D348, which differ between the two folds, are highlighted. The symbols mark conserved turns of homologous regions in the two folds. Knowledge of the structural variants that underlie disease differences in a range of neurodegenerative diseases will be beneficial for the diagnosis of these diseases and for development of new therapies that specifically target tau filaments. The authors of this study were Benjamin Falcon, Wenjuan Zhang, Alexey Murzin, Garib Murshudov, Tony Crowther, Sjors Scheres, and Michel Goedert from the LMB, working in collaboration with Holly Garringer, Ruben Vidal, and Bernardino Ghetti at Indiana University. This work was funded by the MRC, the EU, the National Institutes of Health, the Department of Pathology and Laboratory Medicine at the Indiana University School of Medicine, and the Alzheimer’s Association Zenith Award.